If your organization is looking to go green, Kimble is here to help. We’ll partner with your business to develop a customized recycling service that’s designed to save you time and money. 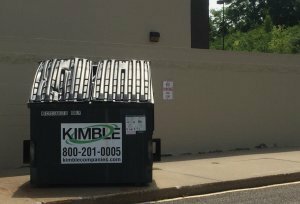 With Kimble, workplace recycling is simple. Our team will pick up and sort the materials, so you don’t have to. We’ll also equip your business with containers and educational resources, so your team has confidence that their items will reach the recycling market. Together, we can protect the environment and promote a sustainable future.